E & H.T. Anthony often exhibited a flare for innovative camera designs. In this case, the Novelette was offered in square and round faces. The example shown here is the less commonly found square face version. Compare it with the round version below. As with the round face version, the square face Novelette also shares the same rotating back and bellows feature that is found on Anthony's Phantom Camera. 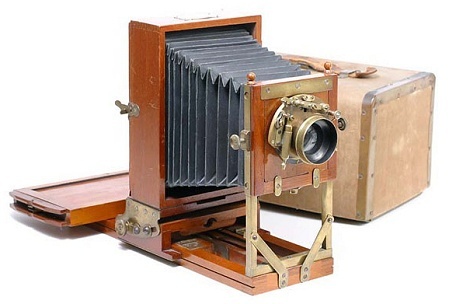 Shown is the 1/2-plate model with the camera is Anthony's "telescoping" case. 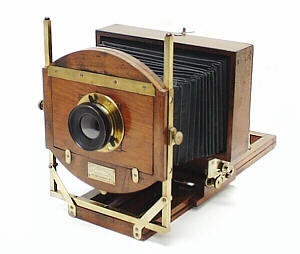 Right: Round face Anthony Novelette camera with the back positioned in the landscape orientation. Note that the round face Novelette has a wide lensboard for a stereo lens set.